Welcome to advanced manufacturing, where robots rule and computer skills and specialized training are as much a part of the job as hard hats and safety glasses. Modern manufacturing is all about merging factory machines and production with technology. Because of an aging workforce and changing nature of currently open positions, manufacturers have a high demand for skilled workers. 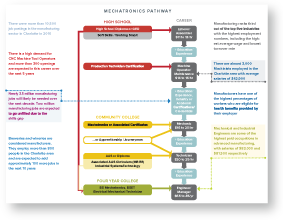 Be sure to check out our certified career pathway in Mechatronics if you’re interested in technology and machinery. 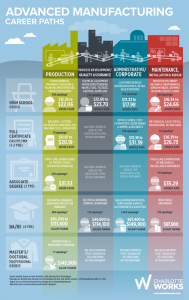 Our Career Ladder outlines each career path available in the Advanced Manufacturing industry for every level of education. Download the career ladder to discover where your career in Advanced Manufacturing can start today!